The Gierre warehouse ladders are the most stable and safe work ladders on the market: equipped with handrails and wide steps, they are ideal especially in warehouses or for working at high heights. Among the various professional scales in the Mister Worker™ catalog, the bunk ladders are undoubtedly the safest, but also the most bulky. They are the best choice when you have to carry out long and complex jobs, because they have a spacious support platform that allows you to remain comfortable and stable for a long time. 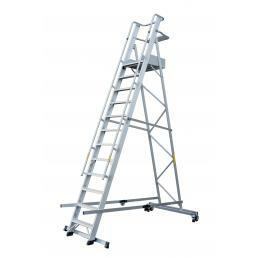 Another peculiar characteristic of the warehouse ladders is the slope of inclined inclination of 55°, which guarantees maximum comfort and safety during the climb; moreover, the steps are wide and equipped with anti-slip knurling, the wheels are wide and equipped with an automatic braking system, and at the base there is a stabilizer that blocks the ladder keeping it in position for the necessary time. There are also warehouse ladders with the narrowest ascent, suitable when you have to work in narrow corridors, for example inside small warehouses: they are equally safe, but more compact and more easily transportable from one point to another. Mr. Worker™ wants to guarantee the maximum safety to all the customers, for this reason to choose only professional staircases certified EN 131 (according to the legislative decree 81/08 regarding safety at work) and built with resistant and reliable materials. If you have doubts or questions regarding the Gierre warehouse ladders, call us at 0291433257 or send us an email to [email protected]: we will be happy to help you.